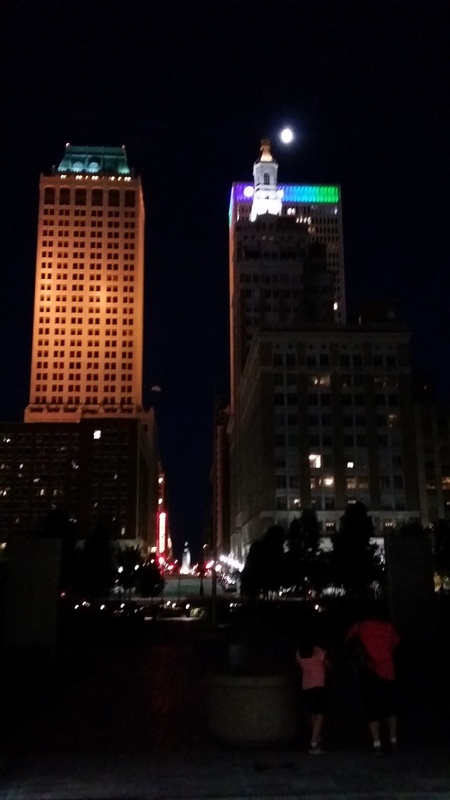 Pictures that Tulsa Bondsman Took while, Walking, Driving, or sitting of this wonderful city named Tulsa, Oklahoma. Alameda Bail Bonds in Tulsa believes in sharing posotive images to keep Tulsa looking its best. We will always try to keep this website looking its best by showing all locations families can go out to have a good time in Tulsa County. If you have any ideas or maybe you would like your location in our gallery contact Angel Alameda and he will go and take photos to share with the rest of the world in places like Google, Pinterest, Facebook, and our website. Thank you Tulsa. Greenwood, Black Wall Street, WE Will Never Forget! What happened in Tulsa, Oklahoma between May 31 and June 1, 1921 should never be forgotten. Our city went through the worst massacre of innocent black people in American History. We most never forget history like this to avoid it from ever repeating. Rest in Peace to all the victims of this Genocide. Tulsa Race Riots have passed but will never be forgotten. While walking around downtown I take a lot of pictures to add to Google Maps as a Contributor and local guide. It helps me get back to shape and also keeps me busy helping Google with pictures of other businesses in Tulsa. Here are some that I have taken, if you would like to add your business feel free to email me at angelalameda1@gmail.com and I will add it with a link as well. Thank you for viewing my photos. Random picture from Alameda Bail Bonds in Tulsa of flowers and plants and landscaping images. We go throughout out Tulsa to take pictures in places like Woodward Park and the Tulsa Garden center just to name a few. We will keep taking photos and sharing them for all to see. Please remember we ar just Tulsa bondsmen and we are not professional photographers. We do this as a hobby and we like to share these images for our friends in Tulsa and any other location throughout the world. Tulsa Bail Bondsman Prefers AUXBEAM LED LIGHTBAR for his vehicle. Alameda Bail Bonds in Tulsa wants the public to know about a great item. Auxbeam LED lights can brighten up you drive at night. These people sell not only lightbars but Headlights as well. Be Safe Oklahoma get a pair today. This lightbar was made by Tulsa Bondsman, Angel Alameda with all Auxbeam Lights. It works, Its Cheap, and I can be safe in the dark now. Alameda Bail Bonds in Tulsa uses Auxbeam brand LED Lightbars for our recovery vehicles. These lights offer you a bang for the buck performance. Auxbeam is our preffered brand of LED Lighting for our vehicles at Alameda Bail Bond in Tulsa. Save money and get yourself some lights like these for your rig. Read about all their good reviews online, AUXBEAM. Go out and get a set of these light for your Vehicle. Tulsa Bondsman, Angel Alameda says you will not regret it. Being a 24 hour business we have to be out at all hours of the night as well. These Auxbeam Lights makes it safer for us to return Home to our families as well. https://www.tulsaroute66bailbonds.com/ Merry Christmas to all Family and Friends. May you have a great one and a posperous New Year. https://www.tulsaroute66bailbonds.com/ Seasons Greeting from our Family to yours. May you have a wonderful Christmas Tulsa, Oklahoma. https://www.tulsaroute66bailbonds.com/ Just got the Santa inflatable in and the lights continue. Merry Christmas from Tulsa Bail Bondsman Angel Alameda. https://www.tulsaroute66bailbonds.com/contact/ Here is the speaker at work this is at 1/4 of a watt since my wife and child were sleeping during recording. Ive never put more then a watt through it with my Yamaha M4 Amplifier. https://www.tulsaroute66bailbonds.com/contact/ Altec Voice of the Theater plywood cabinets with 511B horn and Jbl E140 woofers. https://www.tulsaroute66bailbonds.com/staff/ Just listening to Killer Joe on Cox Cable late at night. Being a Bail Bondsman in Tulsa keeps me away from my hobby sometimes. But when its late at night and raining Ill sit back and enjoy music. https://www.tulsaroute66bailbonds.com/staff/ Just a side view of the speakers. A nice day to listen to music. https://www.tulsaroute66bailbonds.com/staff/ Alameda Bail Bonds is thankful for its loyal clients in Tulsa and everywhere else in the State of Oklahoma. Happy Holidays 918-599-7651.
https://www.tulsaroute66bailbonds.com/faq/ Our Tulsa Bondsman and Family greets you into the festivities of the Christmas Season. Thank you Tulsa For allowing Alameda Bail Bonds in Tulsa to be the best Family oriented bail bonding agency in Tulsa, Oklahoma. Merry Christmas and Happy New Years. https://www.tulsaroute66bailbonds.com/contact/ This cat knows peoples needs. This small Commercial was mad for Alameda bail Bonds in Tulsa for Facebook and Youtube. I kinda think its PURRFECT. https://www.tulsaroute66bailbonds.com/ Commercial about Tulsa Bail Bonds Industry Leader Alameda bail Bonds in Tulsa. Tulsa Bail Bondsman, Angel Alameda offers 24 hour service to all jails in Tulsa County. https://www.tulsaroute66bailbonds.com/sand-springs-jail/ Angel Alameda Sand Spring Bail bondsman offer 24 hour service for all your Sand Springs bail bonds needs Call (918)599-7651 for the best quotes in the city of Sand Springs, Oklahoma. https://www.tulsaroute66bailbonds.com/tulsa-county-jail/ Alameda Bail Bonds in Tulsa serving Tulsa, OK and all cities in the Tulsa like Owasso, Sand Springs, Jenks, Broken Arrow, Collinsville, Bixby, Glenpool, and Skiatook. https://www.tulsaroute66bailbonds.com/requirements/ Review from a previous Client for Alameda Bail Bonds in Tulsa Oklahoma. call us for any bail bonding needs in Tulsa 24 hours a day. We are always open and ready to serve you. Thank you Tulsa. https://www.tulsaroute66bailbonds.com/broken-arrow/ View from Jazz Hall of Fame of the BOK Tower while storms were rolling in. I was on my way to Boken Arrow Jail this night to post a bail bond. I had to stop because the sirens were going crazy in Tulsa. https://www.tulsaroute66bailbonds.com/staff/ Tulsa bail Bondsman Angel Alameda Sharing the spirit of the Holidays with the People of Tulsa. Thank you for the past 6 years of letting us be your best source of Bail Bonds Tulsa. https://www.tulsaroute66bailbonds.com/owasso-jail/ A drive through Downtown Tulsa, Oklahoma by Tulsa Bondsman Angel Alameda. https://www.tulsaroute66bailbonds.com/sand-springs-jail/ Downtown Tulsa, Oklahoma views from Denver Avenue on a hot Summer day.